Best for any type of business like banks, universities, telecom operators, mobile operators, ios and android market sellers. Used mostly by business owners, support managers and marketing agents. A powerful help desk ticketing system. Pricing starts at $15/month. Could be used as a self-hosted solution installed on your server or Cloud option, UseResponse can be embedded and deployed easily. Pros: Right now my favorite feature is the 'inline' FAQ whereby I can add a 'What's This?' icon anywhere on my site which then pops up the UseResponse widget with an FAQ related to the user's current asset. This is fully integrated to the support system allowing me to both inform users of features interactively and allow for extended/related answers and even customer support. Cons: So far not much. The only feature I'd love to include is the ability for FAQ/Articles to link to other articles inside the widget. Right now you are limited to either the sidebar of related articles (which keeps you in the widget) or adding a hyperlink to an artcile which opens a new browser window. I"m told they are working on that too though so that would leave me with nothing to complain about. 4) I can provide a 'Feature Request' system that I can use to not only assess user needs/desires but also keep them in the loop about status of those requests. Overall: UseResponse has proved to be one of the Best decisions we undertook. We were looking for an All-in-One Solution to enable us to manage Our Customer Support Solutions, and UseResponse turned out simply great. We used the Trial version, and got Our Team to test every aspect of the system, and were very happy with the outcome and Information gathered were thoroughly analysed and formed part of Our decision to upgrade. 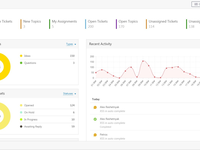 The System interface is highly customisable to Our needs, and it's easier for Our Team to use Its Self-Service Community integration to Gather ideas, Topic Voting, aggregate Problems, Questions, provide support with this great customer feedback software, help desk ticketing system packed in one simple solution. Digging deeper, we utilised the Help Desk Analytics Tools (HDAT) to measure Support Agents Performance. 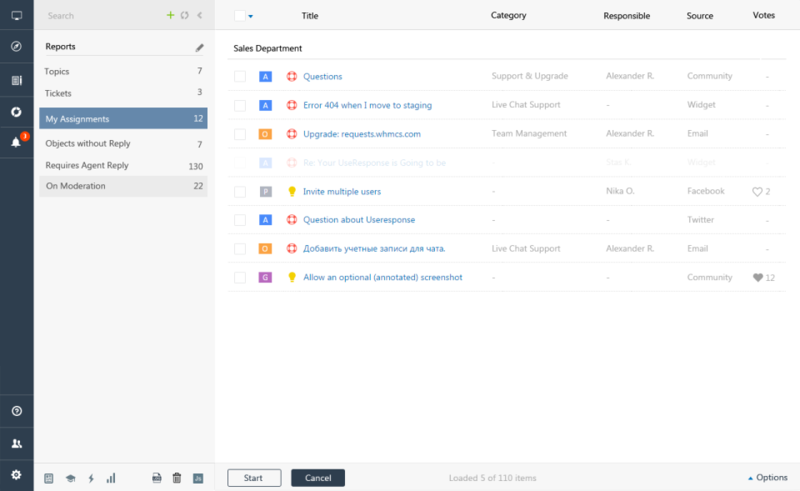 One other great feature is the Intelligent Ticket Processing (ITP) and the ease with which All requests aggregated in one inbox from different support channels. I will highly recommend anyone whose Business is looking for a seamless Combination of Help Desk + Multilingual Knowledge Base Features and API integration and Mobile ready (IOS and Android integration). Throughout the integration Process, the UseResponse Team were of immense support. Their Customer Support Team is great. UseResponse is Value for money. Recommendations to other buyers: This System is best for any organisation that wants to know their Customers very well, understand their opinions about their Products and Services. UseResponse is Value for money. Pros: Very nice complex software that cover almost all needs our team has. 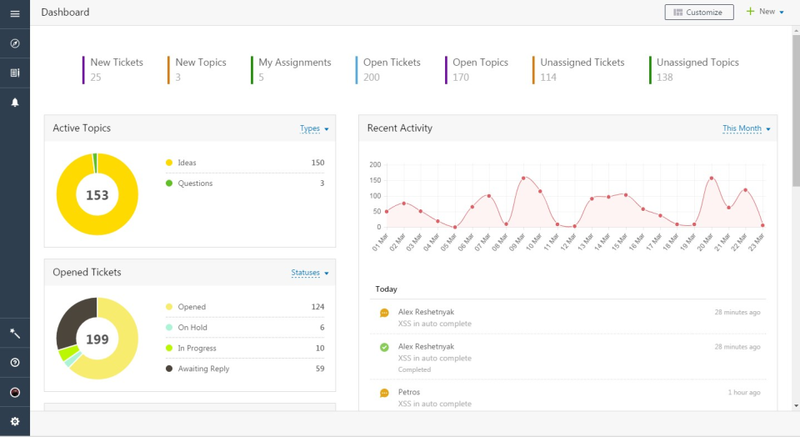 Support email ticketing system and help desk software for collecting ideas and public support. Cons: No cons at all. Pricing is average in softwares of this category. Overall: Only positive experience. 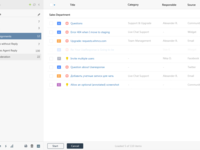 UseResponse is on of tools that works perfectly for our use-case and I may only recommend it. Cons: Notification features would be nice.. but sure these will be added in time.. Happy to stick with it until they don. Pros: Simple UI with great functionality, lot of documentation and support is fantastic. Cons: Email functionalities and integrations like Zendesk is missing. As you improve on these, it would be great. Pros: The interface is very easy to navigate and understand plus the email integration with POP3 is very useful. Cons: The only issue we had was around the time it took to set a ticket to complete however it seems since the latest upgrade to 4.9 the issue is no longer there. Overall: Able to single out this software for one Development and User group. Pros: They've been very helpful when problems arise. Cons: Was a little difficult to customize the theme. Our company have been choosing among the set of proposed service programs appropriate one for a long time. As the main task we set - the ability to reduce the burden on customer support department ,to arrange a convenient system of reporting and evaluation of the support department. In recent years, increased load and fulfilling of all incoming requests was very challenging for us. Selection was carried out by voting, to were choosing from 4 varients put forward. UseResponse received the most votes, especially I want to mention an open source version of Sehf-Hosted- you can adjust the program as you wish. We did` nt need some standard blocks, so we simply removed them from the program, the convenience of withdrawal of a report on agents saved the time for their evaluation,ofcourse the knowledge base could be better (regarding registration), but overall satisfied, we want to note also the speed of the employees, we have received a very quick response to our request for setting up tickets. In general, the cost is very cheap for such a functional product ,in the future we plan to use all the facilities of UseResponse. Special thanks to manager Alex Igrevich for patience. Pros: Its helps us organizing ideas collecting for number of our products and does it very well. Subscriptions for the topics are cool and generally the structure is very flexible. Extremely quick and helpful support. Cons: It is complex system, a lot of features for different directions of use added. Sometimes it get complicated to find the required option quick. Pros: The people and support behind the company! It's a good mature feature set and was fairly straight-forward to setup. They customized our Wishlist as an enterprise solution and we were impressed with the results. Cons: Some functionality we wanted that wasn't available, has been delayed. Comments: We are considering leaving your service as your base design is pretty old style looking. you can check how old looking http://withjoy.useresponse.com looks which is why we are likely to leave the service even though we have paid for it. In order to supply with good service, we are ready to assist you in integration of the system with website + customizing the look and feel of articles and knowledge base to your requirements. As system is very flexible, we try to utilize the common way of providing support in package, but not everyone would be amazed with features we have and UI we provide. Let us know if you can consider using our service, if we are to provide better UI for your needs in order for you to change your mind in regards to this review. Hope you would give us a chance to make product better and change your opinion here. (5) Easy to build a community, get ideas from this community, along with problems faced & accolades. 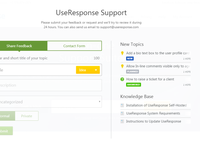 Comments: We have been using UseResponse for about 6 months now, to act as a support portal for our own monitoring software. We have only been getting positive feedback from our customers about the documentation and live chat features. Their support is also a big plus, they usually reply within 5 minutes and are always there to help! 10/10 Software, I highly recommend it! Comments: UseResponse is great to work with. Support is provided quickly and succinctly. The product is so flexible that nearly anything you want to do can be done. Either in house with the proper resources or for a very reasonable price by UseResponse themselves. Timely and important improvements on a nearly monthly basis with more and more improvements always being added and considered. Comments: I'm using this solution only as a ticketing system, but I'm thinking to use more of it. I have a lot of e-mails and requests coming from my customers and it was very difficult for me to organize all of them. UseResponse helps me to organize tickets effectively and with a small amount of time. Moreover, service usability is decently easy. Keep on going that way guys! Compares to competing products at competitive price point. Pros: We switched to their feedback forum tools from another product. UseRepsonse offers similar features for a much better price. Migration, setup, and customization are simple and straightforward. Staff is extremely responsive with support. Cons: While we have largely been please with the feedback forum capabilities, more granularity in things like feedback type and individual forum access would be great. Pros: The solution is really flexible to setup for my specific purpose. For the user it clean and manageable to do acess and discuss topics. And the Customer support - INCREADIBLE: fast response and helpfull to set-up functions that are not basis. Overall: Very possitive. As said flexible and easy solution, and amazing CS. Comments: UseResponse is simply awesome. I set it up literally in ten minutes and their customer support immediately helped me in tuning up the configuration as soon as I got in touch with them. They replied to me basically 24/7, no matter whether I was based in Europe or in the U.S., they always replied in less than a hour. Comments: We choose UseResponse as it could be deployed in our internal network. The installation is smooth and the product is easy to use. But what really stands out is the support. Fast and very customer oriented. This is one of the best support channels I have ever used. Comments: I've been using this product for about 2 month and so far i'm very satisfited with it. It fullfils my needs and costs only 10 bucks a month. Really helps to communicate with my visitors to create a better car repair service. 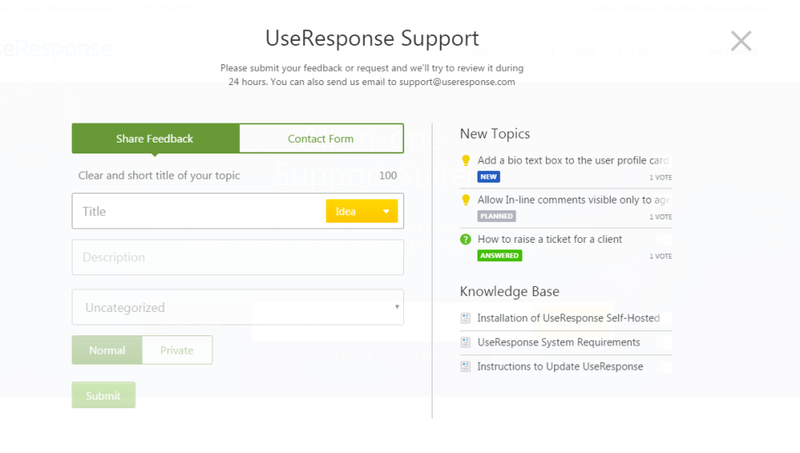 Comments: UseResponse has been the selected product for our self serve support forum concept. They have delivered with great quality & service, and not to mention with great agility. It is also very cost competitive compared to other vendors. Comments: We try the software 5 minutes and we knew that we should buy it right away ! Very complete, easy to use and feature complete. I recommand this software to every support department. Excellent Software and very good Support! Comments: We have been looking for a solution, but wanted the application to host locally themselves. Useresponse was then the brilliant solution! Good design, scalable, perfect! Many Thanks! Product is as advertised and is a great utility for product innovation. Comments: This tool has greatly helped our business with managing enhancement requests and suggestions , as well as feedback from clients. Comments: And very happy with their support too...they solve all my problems the same day!